Audi has a new design strategy that will take the German automaker in a new direction with greater differentiation between model series. Every automaker reaches a point where they need to change the design of their cars in order to keep moving forward. Audi recognizes this is the time to make major changes to their lineup and has created a new vision for what their future cars will look like. Change is hard for most people, and Audi recognizes there is a fine line between needing something new without completely breaking with tradition. The Audi Concept Design Studio in Munich is at the center of the changes that are coming to the German automakers lineup, and we can expect some big changes in the future. There will be three areas where Audi will focus the coming changes on the entire lineup. Wolfgang Egger, Head of Audi Design, knows the time is right for design changes and has a clear vision of what it needs to look like. The first major change the design chief says we will see, is each model series will have its own unique personality and have a greater differentiation between the A, Q, and R model lines in the future. Audi says the first model series to get a new design will be the Q family. The next area of future design change will focus on the technical aspects in the design. The new Audi design language and philosophy will focus on having a strong link between technology and design. Egger’s philosophy is, “Only when design and technology mesh perfectly does an automobile make a statement for the Audi brand.” He says that technology has to be exposed in the new design and no longer enclosed. The new Audi Crosslane Coupe is an example of this new technology being coupled to the design. The Multimaterial Space Frame is a joint development of two teams working together, the designers and lightweight construction experts jointly developed the new frame. It can be seen at multiple locations in the show car: in the single-frame grille, through intakes in the engine hood, at the sills when opening the door, at the A-pillar and as a load-bearing element in the form of a functional carbon strip in the cockpit. The third major element of change will be in the interior and exterior connection. The interior and exterior of future model generations will be closely intertwined to create a “seamless unity” that will be more distinguishable. This will also help each model series develop its own unique character in the cabin as well as the exterior design. This can also be seen in the new Crosslane Coupe. Karl-Heinz Rothfuss, Head of Interior Design says, “The cabin opens in the direction of travel and continues as an unbroken line in the engine hood,” The cabin design will be more driver focused and will enable a greater concentration on the driving experience. “Our refined strategy at Audi Design emphasizes clarity and a focus on the essentials,” says Egger in summary. 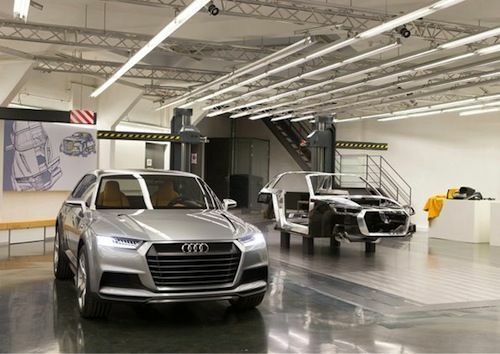 The Concept Design Studio at Audi is leading the way for big changes coming to the future Audi lineup. We are getting a first taste of how the future models will look with the Crosslane Coupe concept. And we can look for the first appearance of the new Audi design on the new Q Series. The most progressive automakers aren't afraid to break with tradition, and Audi is leading the way with their new design strategy. Get ready, because change is coming to Audi in a big way.